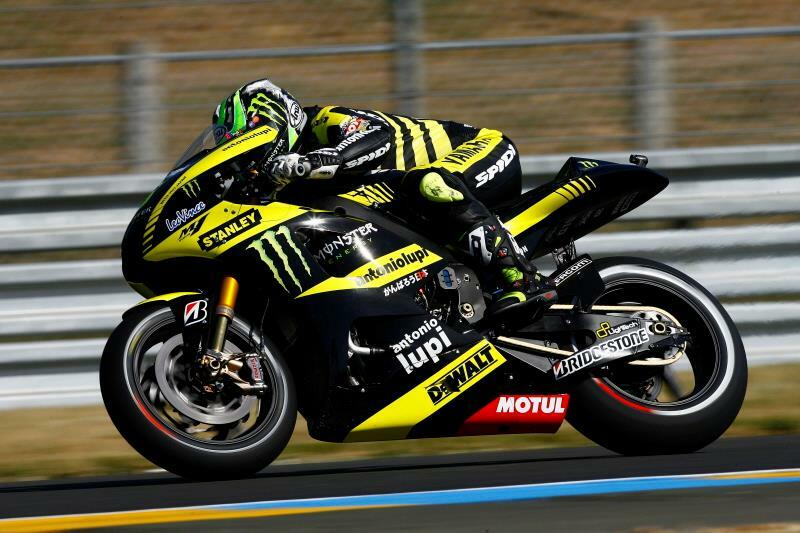 A braking mistake in the final stages of this afternoon's second MotoGP session at the Le Mans circuit cost Cal Crutchlow his chance of a top ten finish on the opening day of practice for the French Grand Prix. The British rider had again demonstrated his skill at learning new tracks quickly by setting the eighth fastest time in this morning’s session. He rode his Monster Yamaha Tech 3 YZR-M1 machine to a best lap of 1.35.731 to finish ahead of team-mate Colin Edwards and factory Yamaha rider Ben Spies. But looking to claim another superb top ten finish this afternoon, the 25-year-old was undone by a crash with just three minutes of the session remaining. Crutchlow had set personal best times in the first two sections of the track when he crashed at Turn 6 while looking to better his time of 1.35.158. Crutchlow told MCN: "I made a big mistake and I was being an idiot basically. Valentino (Rossi) had just come out of the pits and was on an out lap when I caught him. But because he was on an out lap and going much slower than me, he braked much later for the right-hander. The problem was I was at full speed and I braked in the same place as him thinking he was braking in the right place." Crutchlow escaped unhurt but he conceded he would have been much higher up the timesheets had he not made the error. He added: "I was only a tenth behind Colin and he's got a great record at this track. On the lap I crashed I'd done my best splits of the session in the first two sectors and was only two-tenths off the best lap at that point. If I'd lost another two-tenths in the second two splits then I'd have been in the top six. To finish 12th doesn't do us justice at all and if we can carry on tomorrow making the same progression I did today, I know I can be comfortably in the top ten."